uncommon, most rotator cuff tears involve the supraspinatus, but isolated subscapularis tears and supraspinatus tears with associated subscapularis tears do occur and are purhaps more common than previously believed. Subscapularis tears are generaly partial thickness. Reported to be seen in 19% of shoulder scopes. 90% have an associated supraspinatus tear (Kim TK, AJSM 2003;31;744). Classic Mechanism: forced ER or hyperextension for acute tears. 68% traumatic, 32% degenerative; 64% associated biceps instability, 12% biceps rupture (Edwards TB, JBJS 2005;87:725? Origin = ventral scapula, Insertion = lesser tuberosity of humerus and humeral metaphysis. Innervation = upper and lower subscapular nerves. Principle function = internal rotation of the humerus. Also important for anterior stabilization of the glenohumeral joint. Anterior subscapularis is balanced against the posterior infraspinatus and teres minor = transverse plane force couple (Lo IK, AJSM 2003;31:308). Comma sign = Remnants of the superior glenohumeral and medial coracohumeral ligaments are seen retracted from the lesser tuberosity in patients with subscap tears when viewed arthroscopically which can be used to locate the torn subscapularis tendon (Lo IK, Arthroscopy 2003;19:334). Generally anterior shoulder pain, may or may not have associated traumatic event. Often complain of night pain and IR weakness. Anterior shoulder tenderness on exam. Increased passive external rotation is found in complete tears. Lift-Off test: patient places hand behind their back and at the lumbar level and lifts it away from the back. An inability to hold hand away from the back is indicative of supscapularis tearing. (Gerber C, JBJS 1991;73B:389). 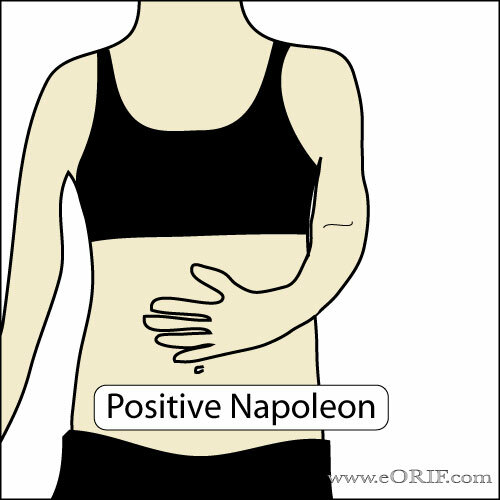 Abdominal Compression test: patient presses palm against their abdomin with the wrist in neutral position and the elbow anterior to the thorax. Wrist volar flexion and the elbow falling posterior to the thorax when patient presses indicates a complete supscapularis tear. (Burkhart SS, Arthroscopy 2002;18:454). supine axillary view is perhaps best to identify glenohumeral joint narrowing and the presence of an unfused acromial epiphysis. In a patient who has undergone previous surgery, this view also can reveal that amount of acromion which remains. Arthrography: easily interpretable, and can clearly identify the presence or absence of a full-thickness tear. Disadvantages invasive, limited to identification of full-thickness tears only, rarely gives information about quality of the tendon or the precise location of the tendons that are torn. CT arthrography with contrast extravasation onto the lesser tuberosity indicates subscapularis tear (Walch G, JSES 1994;3:353). MRI = Subscapularis tears are best visualized on T2-weighted axial images. (Pfirrmann CW, Radilogy 1999;213:709) May give information about associated biceps instability and associated muscle atrophy or fatty infiltration. Medial subluxation of the long head of the biceps is highly associated with complete rupture of the subscap. Narrowed coracohumeral distance (<6mm) is associated with subscapularis tears. (Richards DP, Arthroscopy 2005;21:1223) Disadvantages are patient claustrophobia, cost. Ultrasonography: Nearly as accurate and less expensive as compared to MRI. Difficulty identifying small tears, partial tears, and even degenerative and scarred tissue may look similar. Operator dependent. (Teefey SA, JBJS 2000;82A:498). Atraumatic tears: generally treated non-operatively with activity modifications, NSAIDS, physical therapy. Chronic Complete Tear: repair is often impossible and can require tendon/muscle transfers. (Galatz LM, JSES 2003;12:1). Pec Major transfer provides good outcomes provided the supraspinatus is intact or repairable (Jost B, JBJS 2003;85A:1944). Full Thickness,Partial Length: typically involve intra-articular portion of tendon and may be associated with supraspinatus tear. Generally repaired arthroscopically with concomittant biceps tenodesis. (Burkhart SS Arthroscopy 2002;30:810), (Kim SH, AJSM 2005;33:1825), (Lafosse L, JBJS 2007;89:1184). Arthroscopic bicipital sheath repair (Bennett WF, Arthroscopy 2004;20:964). Long head of biceps tendon subluxation/dislocation/rupture: 31%-56% of isolated subscap tears (Deautsch A, AJSM 1997;25:13), (Gerber C, JBJS 1996;78A:1015)(Walch G, JSES 1998;7:100). Post-op: sling, elbow/wrist/hand ROM exercises. No lifting. 7-10 days: Continue sling. Begin gentle passive and active-assisted ROM exercises. No external rotation past 0º. 6 weeks: begin progressive active-assisted and active ROM exercises.